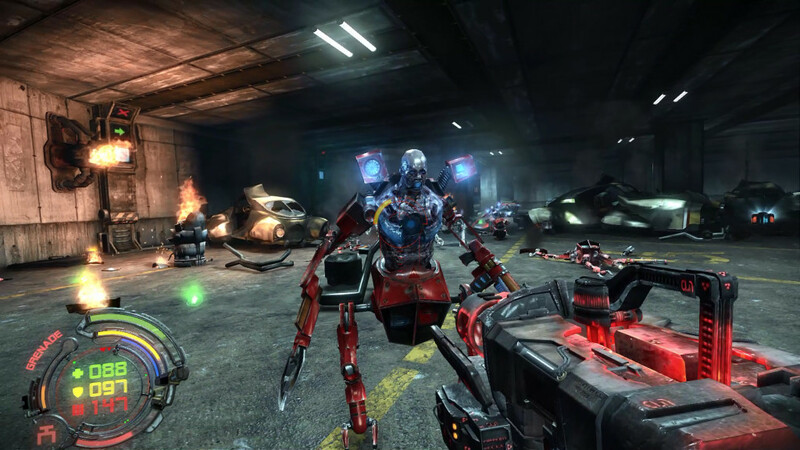 Even though a hard reset is often linked to restoring your PC to its factory settings, it was also a game that was released in 2011, which revolved around the end of mankind, except for one last bastion. The title was probably linked to the fact that human beings have become a thing of the past, especially now that the world is filled with robotic AI. Nonetheless, this shooter received its fair share of attention, albeit with rather mixed opinions. This time the game has been remade, not only for PC but for the current generation of consoles. In a not so distant future humanity has been driven back into a corner by the many robotic life forms that are currently roaming the planet. Humanity is currently residing in their last stronghold, namely Bezoar City, where also ‘The Sanctuary’ resides. The Sanctuary is a collection of digitized personalities of human beings and this is exactly what the AIs are after. They are looking for their next step of evolution, and this is why they need an upgrade in the form of ‘human emotions’. Nonetheless, humanity is trying to keep this database safe, and you are one of those soldiers, Fletcher. Of course, at a certain time the robots breach the city’s defenses and presto you’re called in to clean up the mess. Overall the story is simple but it does the trick. You’ll be treated to comic book-like story sequences which fit the story and the setting perfectly. Don’t expect too much, but you won’t really be disappointed either. Even though the game has a lot of pretty visuals, it’s not really stressing the current generation of consoles. That being said, the weapon textures and some of the environments are quite stunning, but all in all, you come across the same clutter over and over again, which makes the game lose its edge. The rather dark and eerie feel create a certain cyberpunk DOOM setting, which is something that is quite commendable. Perhaps some of the enemies look a tad too simplistically done compared to the rest of the game. Their shiny colors make them stand out a bit too much. Also, for some reason your character tends to wobble a lot, which is perhaps a hint of realism, but it can cause a certain type of motion sickness for some players. While the music tends to go in overdrive during combat, it stays on the background for the most part, letting the atmosphere be properly set by ambient noises. It’s all about the gunfire and the many explosions, seeing there are plenty of explosive items scattered around you to take out hordes of enemies at once. It seems simplicity has taken over this part of the game, which isn’t necessarily all that bad. We only slightly miss that small adrenaline injection from time to time. 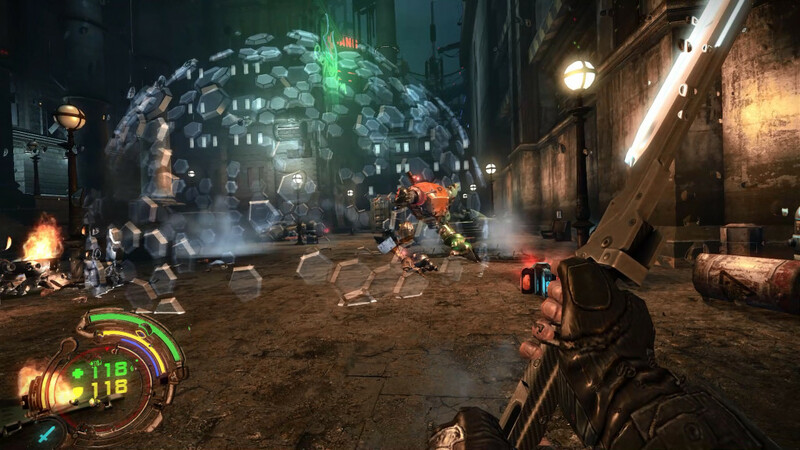 Hard Reset Redux is a rather linear first-person shooter that has certain retro inspired aspects. You’ll have to keep Bezoar City safe, by eliminating all of the robotic invaders that have breached the city’s defenses. It’s pretty much run and gun from the moment you boot up the game. Overall the game is all about the story mode, which you’ll be able to complete in a matter of hours. Nonetheless, the different difficulty modes might create some replay value, but all in all, the game is already quite difficult on the normal mode, as the controls are sometimes a bit clunky to respond quickly. It’s pretty much the enemies that will give you the biggest challenge, seeing the puzzles you’re presented with are doable and straightforward in most cases. Only one thing that is simply horrible in this game is that your character is unable to crouch. You are presented with a lot of obstacles that could be avoided by simply crouching underneath, but for some reason this simple function was totally neglected by the developers. Of course, if you were able to do so, you would never have to take the long way around, but it’s simply moronic to skip the function altogether. 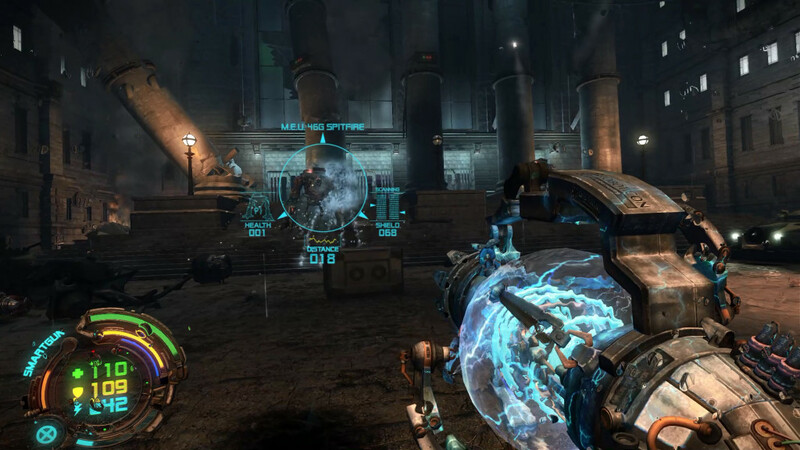 There are clear remnants left of the PC version, especially when having to navigate through menus in the levels themselves or when handling buttons. You’ll see a small hand icon appear, and you’ll have to properly aim in the menus to click on whatever you want to do/upgrade and so on. While it’s only a small remark, things sometimes don’t feel as responsive as they should. A fun quirk of Hard Reset is that you actually only have two different weapons, namely the CLN Firearm and the N.R.G. Weapon (not counting the katana you’ll find later). Even though this might immediately sound excruciatingly boring, things get fun when you start upgrading things. You actually have more weapons, but they are seen as mods for these two base weapons. This means that your main weapons can simply transform into other weapons, yet both still use their basic ammunition types. 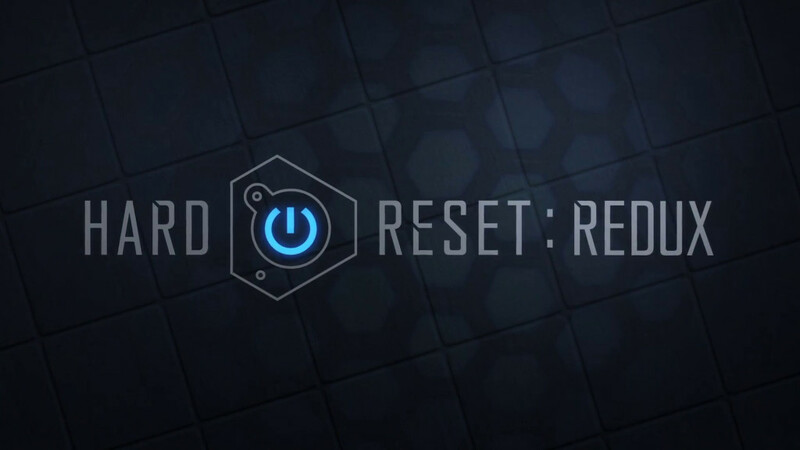 Hard Reset Redux is a very straightforward shooter with a retro feel surrounding it. While the controls might be clunky at times and the difficulty is quite high every now and then, this revamped version of the game is still quite fun, even though you’ll clear it in a few hours and probably never touch it again. That being said, if you’re looking for a robotic DOOM, albeit a tad lower in quality, this one will provide you with a fun evening or two.